Seeking ways to update your wardrobe for spring? Hedi Slimane started showing scarves on the spring 2015 runway of Saint Laurent. Models wore thin scarves tied around their necks in an effortless, rock ’n’ roll manner. 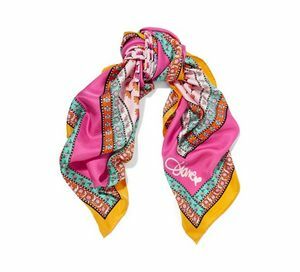 Now, they’re being worn as thicker bandannas and thin, silky versions tied in bows, often paired with chokers and reinforcing the neck and shoulder areas as the focal point of the body ― a trend at the moment. Lanvin, Gucci and Rodarte included many neck scarves in their spring 2016 runway collections. “This is a very easy way to add texture and personalized effect to an outfit,” said Penny Lovell, a Los Angeles-based fashion stylist to Anne Hathaway and Taylor Schilling. The neck scarf still has the 1970s vibe that dominates in fashion now but can be subtle, depending on the style chosen. Designer Phoebe Philo and her fashion pack have a penchant for wearing crisp white Adidas Stan Smith sneakers. Besides Adidas, brands including Asics, Puma, Saint Laurent, Jil Sander, Vans and Nike have increased offerings in white sneakers. The fresh look of the Stan Smith has evolved into the footwear item for appearing like an in-the-know style-setter while remaining comfortable. This sneaker trend is likely to stay around longer than, say, the 5-inch platform stilettos popular several years ago. Sneakers are being paired with ath-leisure looks as well as jeans, skirts and long dresses. “Mixing sportswear with more classic pieces," Lovell said, "is very now." The look was recently spotted on the runways at Gucci and Phillip Lim, and on off-duty models swapping out bulky black leather moto jackets for borrowed-from-the-boys outerwear. Now, silky and more feminine versions such as those from Gucci are being worn as the updated take on toughness. Hunter's suggestions: Use a bomber to add a pop of color, a bold print or a military look with a slight twist.